Introduction of membrane | PRODUCT | DAICEN MEMBRANE-SYSTEMS Ltd.
Our membrane is used in a wide range of fields including water treatment for creating healthy water environment and reconstructing water cycles and life-related industries such as food plants, and receives high reputation. Materials of the membrane we provide are mainly cellulose acetate, polyethersulfone, polyacrylonitrile, etc. The module types are hollow fiber type, tubular type and spiral type, and it is possible to select the membrane module suitable to the need by combining the membrane material and the module type. Especially, "Cellulose acetate hollow fiber ultrafiltration membrane module" is adopted at many water purification plants, and contributes in creating high-quality drinking water. 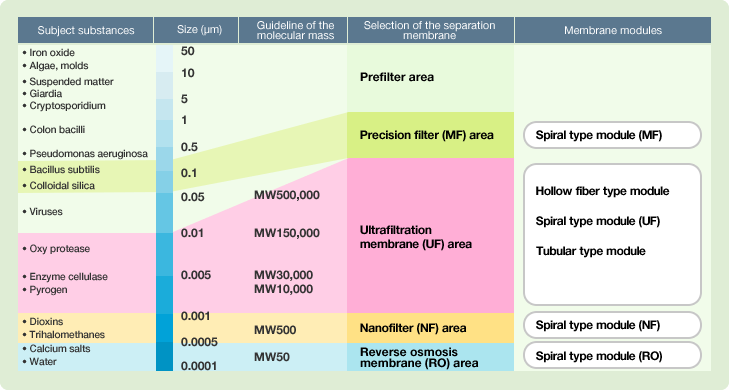 The separation membrane is selected according to the size of the substance to be separated. We provide "Hollow fiber type modules", "Tubular type modules" and "Spiral type modules" with reverse osmosis (RO) membrane. The large F50 type is recommended for water purification. Cellulose acetate, which has the best hydrophilic, is optimal for the membrane material. It is adopted at many water purification plants, and receives high reputation. There are 3 membrane materials for this module: cellulose acetate, polyacrylonitrile and polyethersulfone. We provide various sizes and grades. This is an optimal module for treatment of highly-turbid solutions and liquids which contain a large amount of suspended solids. We are the only tubular type module manufacturer and seller in Japan. This is used in many fields for the purposes such as desalinization and removal of low molecular weight substances whose molecular mass is 1,000 or less. This is a water clarifier which replaces existing coagulating sedimentation or sand filtration. It is used for disinfection and clarification of river water, well water, industrial water, sea water and so forth.